SciFi Question of the Day: If you were on a space station halfway between the Milky Way and the Andromeda Galaxy, would the sky be mostly black? What reason might there be to have a station so far out? 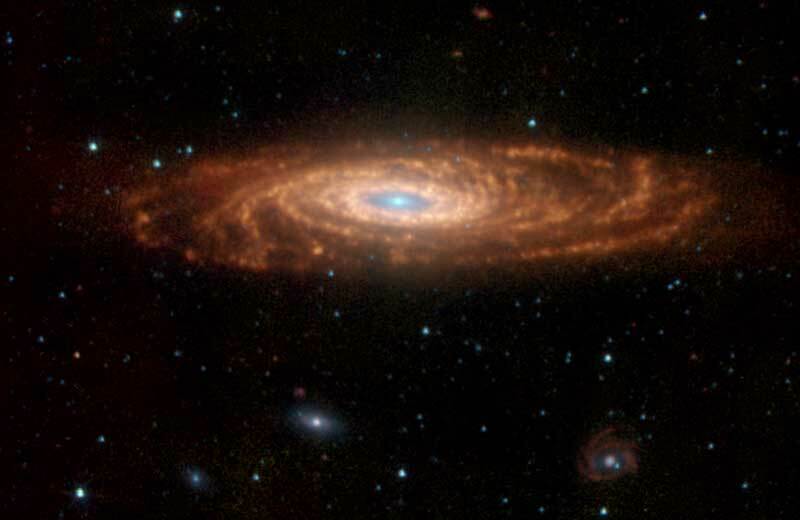 As Andromeda approaches the Milky Way, it will grow until it rivals the Milky Way in size … but it probably won’t get much brighter than our own galaxy. Why? It’s a great place to do experiments with “false vacuum”. If you screw up, you’ve got 100’s of thousands or millions of years to figure out how to fix the damage. Charles Justiz I’m sorry. That is two questions which exceeds your self-imposed one question limit. Please advise when you have returned to your established parameters. AmyBeth Fredricksen It’s pick your own question day! Chad Lupkes There are small galaxies between the two giants, and the eventual goal should be to put a colony around every star we can reach. So a station that far out would be a stepping stone towards total universal settlement. Chad Lupkes oh, and the sky we have right now is mostly black. It might be a bit darker between the Milky Way and Andromeda, but as long as there are stars within a million light years or so, there will always be stars in the sky. Santi Fabrellas Mostly dark, but would there be planets inhabited by humans in Andromeda? If so, then a station between both galaxies would be useful to provide power (dilythium?) to the starships. Glenn E. Smith Kelvin pit stop. Gwendolyn Wilkins I’m in agreement that the sky would be mostly dark – or at least as star-speckled as the non-Milky Way-part of our sky. As for the location question – the logical answer(s) would be either a halfway point pit stop for space ships or a scientific-based station studying properties of open space. Perry Willis Stargate midway point. Dan Thompson Yes, the sky would be mostly black. Heck, even here on Earth the night sky is mostly black. But without nearby stars, there would be less to look at. The light from distant galaxies is too dim for our naked eyes to see, even with zero light pollution and zero atmospheric distortion. Why put something so far out? That one’s easy. You ever see a toilet on one of those starships? Alfred Chesterton I’ve seen this question before… mostly black with the nearest galaxies the only really noticeable things other than what you would see from Earth (normal stars and the like). As for the station… it really depends on the tech behind it. I would say, ignoring the usual ideas like waypoints and supply stations, they would be communication links or some sort of border or zone monitors or they might be linked to something somewhere close enough like a gas cloud. Pedro Calmon The Sky would be filled with stars. We can see Andromeda and all other galaxies from here. There is no reason we would not be able to see them from the middle of the chasm between the galaxies. Gustavo Campanelli there would be no sky, only space. It would be black with a lot of stars on the sides and some in the middle, and a lot would be stars we don’t normally see because of our atmosphere. As for the reason, jump ships can only travel so far before needing recharging their energy banks to accumulate for the next jump, so a place to stay and spend some money would be nice, in addition to a repair crew with a portable shipyard for big repairs. It could also act as a middle point for merchants, a trading hub, so transport ships from one galaxy don’t have to go all the way to the other galaxy. Mackey Chandler Andromeda stretches across the sky several times the size of the moon. It is just faint and lost in the other stars in our sky. Perhaps you’d see it by eyeball if you were on the fringe of our galaxy. I’m not sure. Sounds like a good place if you don’t like your neighbors. Liam Anderson The temperature is absolute zero. The space station would be perfect for cryogenic storage. Vladimir Vasquez I have read that the gravitational lens for our Sun is halfway to alpha centauri, so I’m no expert, but perhaps the gravitational lens for the Milky Way is halfway to andromeda? If the gravitational lens for a star is cool, can you imagine the gravitational lens of a whole galaxy? Adrian Brooks I disagree with Pedro. The stars we see are nearby, in our own galaxy. Andromeda would dominate the sky in one direction, faint, but several times the size we see the moon, and there’s nothing brighter; 180 degrees away would be the Milky Way, similar but different (I don’t know the size or shape it would appear to be, but it’s possible to find out). The magellenic clouds may be apparent. The faint scattering of other apparent stars are all other more distant galaxies. Robert Saint John Don’t know if it would be extremely black in space at that point (no atmosphere or possibly even nebulae to filter out light); but a good reason to be there might be that such a void would be an ideal place to investigate dark matter. David Foster I remember that in Stargate SG-1, they had a station between the two galaxies, to facilitate Stargate travel between two gate networks. Anthony Russo The sky I believe would be just the same as if we were in orbit around the Earth. All the stars visible as always except sun and planets would not be dominating the view. Reason to be there would be to hold us in the Lagrange point between the two galaxies for conservation of energy that the space station uses. With the new treaty of intergalactic peace that us MilkyWayians,(MilkyWayites? Milkians? Wayites? Oh I don’t know) and the Andromedans have, it will be a popular place to intermingle. Dalt Wisney Research station that’s involved in something dangerous? That, or someone wants to be on the Spacestation: Impossible with chef Robert Irvine. Evan “Skwid” Langlinais Intergalactic FTL travel is possible, but the resource consumption is prohibitive, requiring a refueling/replenishment station midway. David Foster Have the galaxies gotten appreciably closer at this point? Might be interesting to study the collision of dust clouds and/or dark matter. AmyBeth Inverness I need to ask +michael interbartolo if we would only see the stars in the Milky Way “over there” and the stars of Andromeda “over yonder” and… what in all the other directions? Mostly black? michael interbartolo I think there are plenty of other galaxies that would fill the sky. might be fainter if you were truly between galaxies not sure. This entry was posted in SciFi Q of the Day and tagged Charles Justiz, galaxy, Michael Interbartolo, Milky Way, Pegasus, visible stars. Bookmark the permalink.